There is no doubt that we live in a disposable society. In contrast to earlier times when excellent craftsmanship meant product durability, nowadays our first response when something has served its purpose is to get rid of it. This is true for a diverse range of products from personal razors to computers, whose built-in obsolescence boosts manufacturers’ profits. While some people would describe the phenomenon of “disposability versus longevity” as negative, in some instances, modern technology has led to manufacturing breakthroughs that translate into greater consumer convenience. Daily disposable contact lenses are one example of this. In 1994, Johnson & Johnson introduced ACUVUE® – the first daily disposable contact lenses in the U.S. Contact lens technology has progressed significantly since then. Now, even toric lenses for the correction of astigmatism as well as bifocals are available in daily disposable format. Daily disposable contact lenses are ideal for occasional use such as playing sports or for special events involving one-time use – like a wedding – where replacing eyeglasses with contact lenses is an important cosmetic consideration. These lenses are also a good choice for people who combine contact lens wear with spectacle use. Some of today’s disposable lenses are made of the same materials as traditional lenses; other disposables are made from new materials developed specially for this purpose. An important advance in the technology of these lenses is that they are now offered in a broader sphere power range than ever before, from +8.00D to -12.00D. In addition, some lenses offer diameters surpassing 14 mm, which makes them available to a greater number of patients. 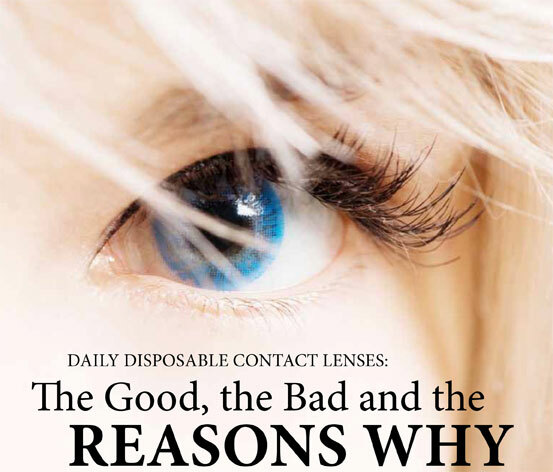 Daily disposable contact lenses provide several advantages, the chief of which is convenience. Since contact care, cleaning and disinfection are not required with daily disposables they provide a measure of ease of wear. Daily disposables also offer a number of key “ingredients” that practitioners look for in a high-performance lens, including low rotation (which is of value with toric lenses), lens stability and high oxygen transmissibility. Daily disposables are thought to reduce the risk of protein deposits, eye infections caused by the lenses or the solutions used to clean them – including fungal keratitis and Acanthamoeba keratitis – and eye ulcers. Since they are replaced daily, the time for deposits like proteins and allergens to build up on the lenses is reduced. Moreover, many of these lenses offer some protection from UV rays, which is particularly relevant for patients who play sports. However, it should be noted that the UV protection does not protect the bulbar conjunctiva which means that daily disposables do not eliminate the need for the eye protection afforded by proper sunglasses. Although toss-away lenses are perceived as expensive, they eliminate the need for contact lens solution and, more importantly, the contact lens case, which is a significant risk if not disposed of at least once every two to three months. Some practitioners maintain that the difference in the cost of disposable contacts compared to that of traditional contact lenses is minimal and is offset, at least in part, by the reduced need for cleaning products. Daily disposable lenses might not be available for certain uncommon prescriptions, and certain specialty soft contact lenses, such as color contacts and theatrical contact lenses, are not available in daily disposable form. Complications due to contact lens wear are estimated at five percent of contact lens wearers each year.Most of these situations arise from non-compliance with the prescribed wear schedule, not using solutions properly, improper maintenance of lens cases or failing to dispose of cases at least every three months. It is crucial that eyecare practitioners discuss the importance of compliance when counselling patients on contact lens wear. Daily disposable contact lenses represent a positive advance in terms of patient convenience and comfort and may, in fact, constitute a large portion of your practice. However, they are not without drawbacks and patients should be presented with “the whole truth and nothing but the truth” when it comes to their use.